1888 was a pivotal point in Van Gogh's life. Vincent van Gogh leaves Paris in February and moves to Arles in the south. At first the bad, winter weather prevents Vincent from working, but once spring arrives van Gogh begins painting the flowering Provence landscapes. Vincent eventually moves into the "Yellow House", a dwelling he has rented where he will paint, and from which he hopes to establish an artists' community. 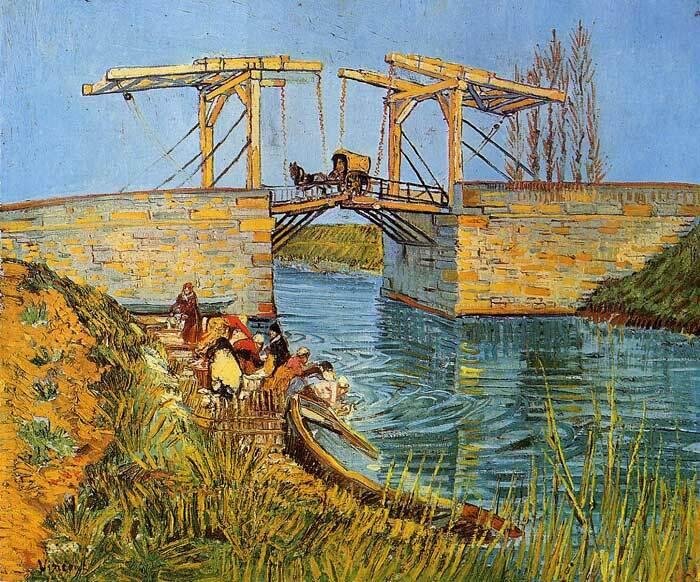 Van Gogh is extremely productive during this period when he paints a number of landscapes (in Saintes-Maries-de-la-Mer), including this one - The Langlois Bridge at Arles with Women Washing, as well as many of his most famous portraits (including his series of the postman, Joseph Roulin, and his family). SPECIAL NOTE : The painter will make the reproduction as close to the original oil painting as possible. If you want your painting to alter from this likeness, please email us and " The Langlois Bridge at Arles with Women Washing, 1888 " will be reproduced according to your special requirements.